"American Indians constitute the smallest segment of minorities or "People of color" in the United States. In the multi-cultural feeding frenzy surrounding the theme of 1992, American Indians face the danger of being swallowed-up and neutralized by the huge "people of color" movement whose wide agenda threatens to deny our unique voice and identity with the same nullifying effect as the dominant white culture." "We artists are called upon to perform the "living-in-two-worlds" balancing act in the public arena more than most other Indians….We have an opportunity to promote Indian truths and at the same time help dispel the myths and stereotypes that are projected upon us". 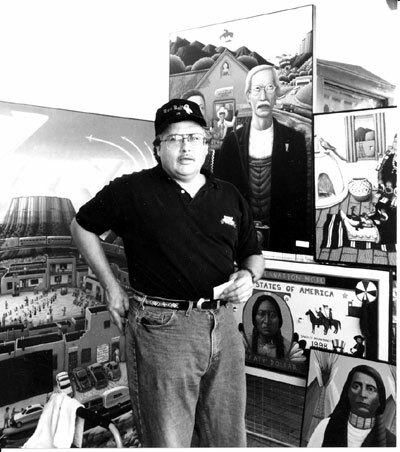 In his paintings, Mr. Bradley interprets popular imagery in a native context.